Along the trail mushers often have to drop dogs or give their dogs a ride in the sled. Mushers are so in tune with their dogs they know when their buddies are tired, hurt, sore, or just don’t want to run anymore. It is in the best interest of the dog and the team to drop the dog. Sometimes, they will give the dog a rest and let them ride in the sled. 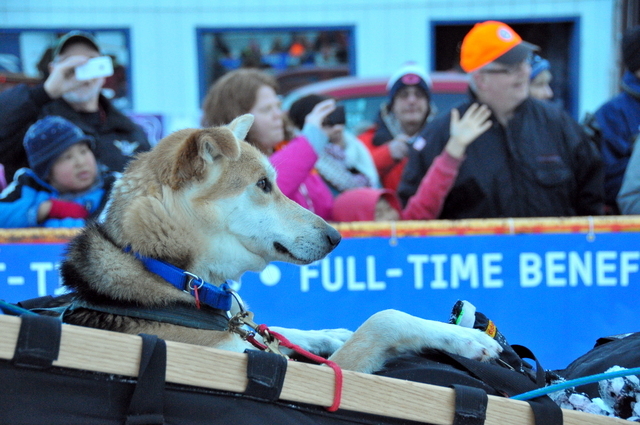 When Kristy Berington arrived in Nome she had a dog in her sled. Her dog appears to be having the ride of his life. How many dogs have been dropped? Caption the pictures below. Hover over the picture to see my captions.